No longer wanted, even if it still works, like that old printer that you hate to throw out because your new computer won't talk to it. The term "obsolete" comes from the Latin for "grown old, worn out." In our 21st-century business environment, obsolete often refers more to technological than physical wearing out. But, of course, something can become worn out and discarded. Equipment, machines, or vehicles can become obsolete. Laws and regulations can be out-dated. Concepts, theories, and traditions can also be outdated. The noun form for the word obsolete is "obsolescence," a condition of being obsolete. For example, "Some people say auto manufacturers practice planned obsolescence, making last year's model obsolete so as to sell this year's model." Technologically outmoded by newer technological innovations. In the context of business, that printer I mentioned above is an obsolete asset. Business assets can be anything from a desk to computers to inventory to machinery and equipment to a company vehicle. 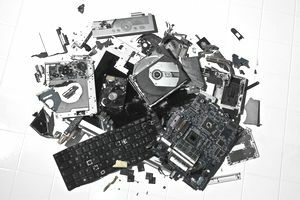 Obsolescence in the business sense is the loss in value of an asset due to loss of usefulness or technological factors; obsolescence describes an asset which is "out of date." Obsolescence is not related to the physical usefulness or workings of the asset. You may know that a particular business asset is obsolete in general because you have replaced it with a newer model. But we need to focus on obsolescence in the accounting sense. Physical. At the end of the asset's physical life, it is no longer useful, due to "wear and tear"
Technical or technological. At the end of an asset's technical life, it is replaced by newer models. In accounting, useful life is related to the concept of depreciation. At the end of an asset's useful life, it becomes "fully depreciated," ​and is written off the business balance sheet. The difference between the cost basis of the asset and its value at write off is considered a capital loss, which affects the business taxes. Inventory (goods or parts held for sale) is also a business asset. Inventory can become obsolete if the inventory becomes unsaleable. In this case, the inventory is written off and the company takes a loss. This loss affects the business taxes of the company. Note that an asset may have no value to the business and be obsolete from an accounting sense, but the asset may still be in working order (like a desk) and may still be used by the business.